Writing more travel blurbs... several about Croatian islands. Ilovik is a small island in the northern Adriatic. It is an evening custom there for men to play accordions in the streets and there is singing and dancing of folk music. When does the boat leave? Reading another book, this one set in California the carrotwood tree was mentioned. Whew... two new tree names in one week! It seems that carrotwood is a serious invasive in Florida, but just a benign ornamental in California. It's a broadleaf evergreen, Cupaniopsis anacardioides, in the Soapberry family. It was a day with several points of interest... One of my on line writing assignments was travel information about the island of Madeira. I am ashamed to say that I wouldn't have been able to even tell you where it was before that. Now I want to go there! It's in the Atlantic, part of Macaronesia, an autonomous state of Portugal. It has mountains, deserts, and ocean beaches. It has a World Heritage Site- the laurisilva, which is the largest remnant in the world of a prehistoric laurel forest with many unique plants and animals. It has miles of hiking trails which were built as paths beside the canal system that brings water down from the mountains. Some are quite tame. Others have cliffside paths and tunnels. There are two nature refuges on the small islands and one of the few remaining colonies of monk seals, several indigenous birds, a bat, and unique land snails. It has one of the highest sea cliffs in the world. The main island is only 13 miles wide, yet the mountains go from sea level to 6107 feet and then back down again! I want to go. And then there were the sparkling weeds in the morning. 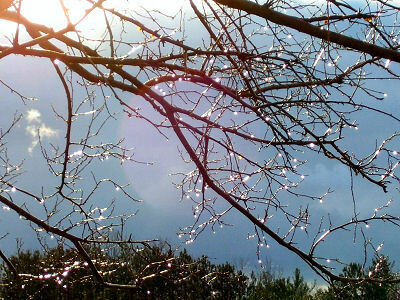 The day warmed up to nearly 40 degrees in the afternoon, but it began with frosty sparkles. I don't think anyone is going to throw money when they hear us play (well, actually Sean on the bagpipes is good enough that he gets paid to play sometimes), but Jason and I are mostly having fun. We finally figured out how the three of us could play together. Sean mostly plays by ear (and I don't very well). But he had a book of Christmas carols for bagpipes. But the bagpipes are in a different key. Jason and I figured out that we could play from that music if we just played the same notes, but added two sharps. So the three of us played a whole lot of carols, and Jason and I played some other stuff too. When we get a chance we are working on some folk music, waltzes, and stuff like that. The sun came out for a little while today. It was just above freezing and water was dripping off the edge of the deck into little pools below. When the drops hit the water they splashed in heavy drops, with the sun on them, like little bouncing diamonds. I couldn't catch a picture. Another new word! I love it. Spall = flakes of a material that are broken off a larger solid body and can be produced by a variety of mechanisms, including as a result of projectile impact, corrosion, weathering, cavitation, or excessive rolling pressure. Spall and spalling are now used by particle physicists. The neutrons that are ejected from the bombarding of a uranium target with atoms are known as spall. Well, I sure learned something today! I'm reading another mystery book... it's not so great. But it's set in Maine, and they keep talking about beetlebung trees. What the ...? So I looked it up, and it's a local term for the Black Gum Tree, Nyssa sylvatica, also called Black Tupelo. So it's really an old friend of this swamp-stomper, but I sure never heard that name before. It comes from the two primary uses of the wood in colonial times. It is a very hard wood, and it was used for beetles and bungs. A beetle is another name for a mallet, and a bung is the plug in a barrel or keg. We rarely use the word bung any more, but bung-hole has stuck around in modern use. Look who was feeling frisky today! She came down the stairs by herself twice, and wanted to be held and petted (an attitude she has developed in her old age). She even climbed into a favorite hiding spot in the utility room for a few minutes. She makes us smile! A lot of things didn't go so well today. Nothing major, but many annoyances. However, the snow was good for skiing this morning. Now that doesn't mean that I'm a good skier, but I like to try. Give me a few more days of good snow and I'll get more comfortable with it again! Maggie and I took our walk on the roads today. We've had snow for 4 days now, not enough to ski on really, but it sure begins to look like winter. 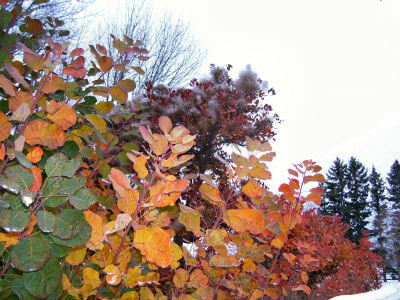 And yet at the entrance to a mobile home park just down the road a smoke tree, and multiple suckers growing beneath it, just insist on one last colorful hurrah! Where Does an 18-Year Old Kitty Sleep? Same as the gorilla... anywhere she wants! She switches locations fairly often... when we first noticed her getting a little goofy, over a year ago, she chose the kitchen sink for about a month. Since then it's been a progression of places that were seldom ideal to the silly human brain: on top of piles of paper, right in front of the refrigerator door, etc. But this week, she's taken possession of a box. It fits her perfectly. I know, this is really a more normal cat choice. Yet, I smile every time I walk by and see her "hiding" in there. And the book? Yes, it was really good. It turns out that it's really a love story, although you don't know that for a long, long time as you read (which was why I didn't recognize it as the favorite movie of a friend of mine until nearly the end... sorry Elaine, it didn't seem like the same plot!). It was a 1942 movie with Ronald Colman and Greer Garson that was nominated for 7 Oscars, but Mrs. Minever beat it out of getting any. Anyway, I sure like the way the book draws you in until you really want to know what happened to the characters. Today's best event kept me from getting much done, but that was ok. It's been a long time since I started a book that I couldn't put down, but I grabbed one out of my "unread book box" at lunch. It is Random Harvest by James Hilton. It was published in 1941, and is also set in the period between the two world wars. That alone makes it somewhat unusual. I got about 2/3 of the way through it before I really had to move on to other things. I'll tell more tomorrow after I finish it. Hopefully, the ending will be worthy of the rest of the book. I missed the first one, but not this one. It was SO pretty this morning! I have a cold... not too bad, but don't feel like doing much. But today it was raining a heavy rain, coming straight down, almost snow but not quite. Then the sun shone out from behind the clouds a few times and made everything sparkle. First of all, I lied. Well, I didn't know that it would be a lie... 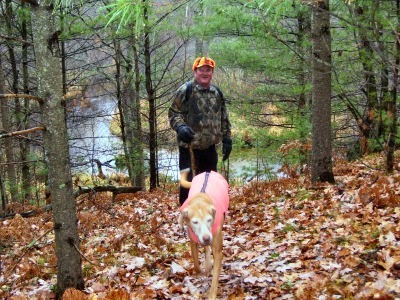 Earlier I said that Saturday's hike would be the last one before gun deer season. But when I said that, it was forecast to rain pretty much all week. And indeed, it is raining now. But earlier in the day it was dry and relatively warm. So Maggie and I hiked the Nature Trail at Orchard Beach State Park before the Trail Chapter meeting in the evening. That was ok... there were a couple of interesting sections of spruce and hemlock that I hadn't seen before. But the best part, the quality part of the day, was sitting in the car waiting for the meeting location building to be opened. The twilight deepened, and the wind was rising. The branches of the evergreens were beginning to sway and be tossed. A squirrel made a wild leap from one tree to the next and then scurried down the main trunk. Several different species of conifers were planted where I was parked and each one moved with its own rhythm born of branch shape, sap content, and location. Yet, the dissonance of motion was not disturbing. To my left, the bare boughs of maples stood stolid above two firs whose motion was greater. They presented more surface for the wind to catch. A small gray fox followed a careful path across the lawn, pausing for a moment in the circle of light by a lamp post. It crested the low hill, and was gone. 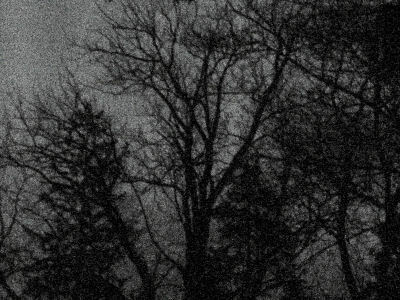 My eyes half-closed, and the motion of the trees and the swaying of my thoughts became one. I used to spend hours letting the patterns of natural lights on water, or motions of waves, seep into my brain until all was one. It has been a long time since I've taken time to allow that to happen. A wasted hour before the meeting? No way. Well, I can't prove it to you yet, but I learned how to use the web cam on my computer, edit a video and save it. For now my goals are humble; I just want to make videos for some of my product reviews at Shared Reviews. But they have issues with uploading sometimes, and I can't get it to upload, so you can't see it. Don't worry, this one's not up for an Oscar. But it's a modest beginning. And by the way, my mom would have been 99 today if she were alive! I read today that the average American spends $16 a day on food. That works out to $112 a week. Yikes! I haven't figured it out lately, but I think that is about how much I spend in 3 weeks. Here are a couple more interesting facts that I would not have guessed. It is impossible to determine the gender of an individual solely by means of handwriting. Although we may characterize certain styles as masculine or feminine there is no correlation with the actual gender of the writer. a person's handwriting may change abruptly due to physical or mental illness or healing from either of those. It may change abruptly as the result of some stressful or other significant incident. The book I am reading focuses on interpreting general characteristics of the writing rather than analyzing particular letter strokes. Current theory is that it isn't a valid science, but it's pretty interesting anyway! Woke to the first snow of the season this morning, but since I overslept, I was rushing to make it to the trail club hike on time and didn't take a picture. It was wet and fluffy, about two inches, covering all the bushes and trees. It was melted before I returned home. Farther east at the hike location it had not snowed hardly at all. One other hiker braved the suddenly cold and damp weather. Maggie wasn't too happy about those conditions! But we hiked the outer loop at Sheep Ranch Pathway, about 4.5 miles, and finished just before the serious rain began. 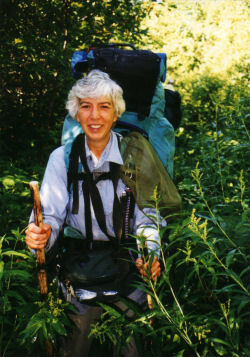 The picture is of Wayne, the other hiker, and Maggie, at the closest approach to the Baldwin River. Last hike? Oh... not REALLY, but it might be the last one before gun deer season begins on Nov 15. I pretty much stay out of the woods for those two weeks of the year. I've always had some interest in graphology, the study of handwriting. But I've never tried to learn much about it. This summer I picked up a book written in the 1950's on the topic... hey, I will pay 10 cents for fun topics! Just for the record, it's Handwriting, A Key to Personality by Klara G. Roman. So I'm sure that the art or science or hocus-pocus(whichever it is) of graphology has changed in 50 years. Nevertheless this book is quite interesting, even as an historical snapshot, if nothing else. Here are several points that seem sensible that I hadn't either thought about, or didn't previously know. Whatever aspects of our character affect all our motions, such as things which make us hesitant, or graceful, or aggressive, or tense will also affect the movement which drives our writing. This shows up even in the scribblings of toddlers before they learn to write. Scribbles of every child are distinctive. Normal adolescents go through a period (several years) of applying unusual pressure while writing, then several months of unusually light pressure near the end of puberty, before the pressure the exert on the paper returns to a normal level. Cultural artifacts show up in the handwriting of entire populations. For example, Americans' writing tends (well, 50 years ago) to be more open and individualistic than British who are taught to be more reserved. I'm about a third done with the book... it's fascinating whatever you believe about graphology. Doesn't the name "Sempervivum" just sound like a march? Today wasn't too exciting. Computer work all morning. In the afternoon I did manage to get the hoses put away, some garden ornaments taken in, a few perennials planted, and the dog walked before the sky darkened and the summer weather ended. But look what was blooming in the flower garden! This is the strangest little sempervivum (live forever! 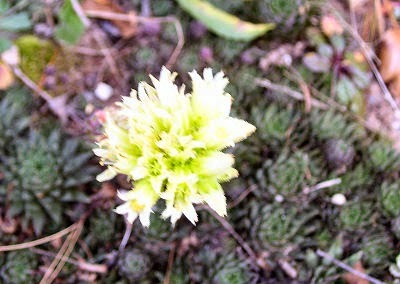 ), also known as Hen and Chicks. All the other varieties that I have bloom with various pink, aster-like flowers. This one has a cluster of little yellow bottles. It's hardy and it grows like wildfire. And here we are, after two hard frosts already, with a gorgeous flower head on the 6th of November. March on to your own drummer, little sempervivum! I Could Do This For a Living! Oh, wait! I am trying to do this for a living. Too bad I can't live on 5 cents a day! Today I went to check out the eastern end of this idea of mine. Drove down a dirt "road" to try to reach Black Lake. I think I could have made it all the way, but reached a corner of a loop I wanted to check out... one of the two branches was bound to go all the way through! So I locked the car and hopped on my bike continuing down one of the forks through really deep sand ruts. But they only lasted a little while, and I kept making choices at Forest Roads (FR) with numbers that didn't match my map, but always working my way east. Pretty soon I got to Benson Road, a real county road (so far so good). Next I wanted to find another FR that headed east again to connect with the North Country Trail. Rode up and down Benson and finally took the only road going in the right direction. It ended at a logging site about 1/2 mile into the woods. And I'd had to walk the bike over a bunch of slash piles. Let's see... turn around and walk the bike back, then ride around via roads, OR... walk on through the woods to get to Campbell Road. Well, the woods were pretty flat and fairly open. So I bushwhack-walked the bike through to the road! Found the other end of the road that I wanted and rode it back west... it dead ends at a cabin, so I guess that option won't work. Went back to Campbell Road and rode east on a FR till it crossed the NCT. What used to be dense woods here is now a clearcut due to salvage after big winds we had here last year. It's kinda sad, but there are now a couple of nice views. When it stops looking so raw, it might be something of a nice addition to the closed-in woods of most of the trail. Then I needed to ride back to the car. So I rode back up to County Line and went west till I found FR 8367 and took it south. There were a LOT of junctions, but most of them had carsonite posts with FR numbers, so without much trouble I found Black Lake, and then back to the car. Just one more out and back, after driving another 1/2 mile to connect to Koenig Road. This is starting to look like a viable route. And what could be better than exploring on a warm fall day? The old 2-tracks are covered in brown crunchy leaves. I really like riding my bike down the old tracks. Only had to walk in a few places where the sand was too loose. Approximate distance: 14 miles! I am one happy, old, 10-year-old tonight. Click the picture and you can work the puzzle. The day was hard to beat in so many ways! For starters we are having what may be the last really warm days of the season. It made 70 degrees in mid afternoon. And where was I? For once, NOT stuck inside on such a glorious day. I have this dream of an adventure loop that encircles our county. Pieces of it are already in place and it has occurred to me that if I just figured out some connections that would work for the rest of it that it could be publicized. So aided by maps and some suggestions from Ramona, my favorite Forest Service person, I headed to the woods with my bike. I wanted to explore a workable route to ride on forest roads in various stages of abandonment. Most of them have no marking. I parked at a known intersection and followed what looked like a "nothing" path into the woods. It came out where I expected despite being a pathway not on either of the maps I had, and I just kept wiggling my way west on pathways, and I DID connect right up with a known trail system that I was looking for. Sweet! Then I rode back and went the other way. I wasn't sure that this road went through at all. It got pretty faint, and came to a creek. I explored on the other side, and the road did continue so I carried the bike over and rode on. The road got better the farther I went till it was a nice sand forest road that came out right where I expected. So I rode back to the car via better roads, moved the car, and continued to ride the "route" on more civilized roads (there is a section in the middle with no National Forest land so it will have to be just a road ride). Made it to US31, turned around and went back to the car. Total time on the bike- about 3 hours, with more "off road" riding than I usually do. It was really great. What more can I say? I'm doing it again tomorrow on the next section, but there won't be quite so much serious exploring. I have to say that I've rarely gone in search of forest connections with so few dead ends or curious twists that don't go where I expect them to. I did check out a few dead ends, but all my hopeful connections worked on the first try. Everyone needs a day like this once in a while, eh? Not much to say about today, but I was really disciplined and got a whole lot of web site work and writing done. That means that tomorrow, when it's supposed to be another nice day, I can go outside and play, right after I vote. That's plenty enough to make today a Quality Day! I'm trying to get Big M ski area (Udell Hills) added to my Get Off The Couch web site. It's a huge area with over 40 miles of trails. I've been making slow progress on it for months, collecting info, making the map. I finally managed to hike all of the ski trails and get descriptions in the past couple of weeks. Now those have to be taken from my tapes and coded into the web site. The map has to be finished. There are also mountain bike trails that I've not yet either walked or ridden, but I have some descriptions of those from an old, third-party source. At any rate, I got a lot of work done on this page today. I finally feel like I might actually be able to get it posted in just a couple of days with enough info to be useful. So that's why I feel good about today! Did some "chilin' out" too! We went to GR last night and met up with Jason M. who got us in to the Symphony as guests on his student pass for $5 each! Om said, "Nobody dresses up for concerts anymore," so we went in jeans. I saw 5 people in jeans and we were three of them... o well! We got to spend some time with friends Fred and Margie H, and son Dan too, since Jason is bunking at their place! We went out for dinner and chose an Italian Restaurant where Om and Jason had eaten lunch. Well, the dinner menu is quite a bit different (more expensive) from lunch! We finally decided that instead of leaving (they had already brought our bread basket) we just ordered soup or salad! Jason had beef tortellini, I had carrot-ginger, and Om had an endive walnut salad. The tortellini broth was very thin. I think I got the best deal with the creamy carrots, and the endive must have been hearts or stalks... it was long shards of white rather than curly green stuff! But Om bravely ate it and said it was good. I am continually amazed at his new fearless attitudes toward foods! On to the symphony. The musicians were very good, and it's always great to hear live music! I didn't think most of the pieces were very spooky, but most were new to me, so that was fun. My favorites (given the Halloween theme) were Kikomara by Liadov, and The Miraculous Mandarin by Bartok. Kikomara is a theme based on a small Russian monster with a head of a thimble and body of straw. The Bartok piece is music for a play which is so lurid that it is rarely performed even 100 years later. But the music fit the theme well. And they also did Mussorgsky's Night on Bald Mountain... always a winner. Afterwards we went back to where Jason lives and ate a little more food. I got to try something new... one of my QD Elements. He had dried kelp from the Asian foods store. It was terrible! unless you like melt on your tongue green dead fish taste! So now I know I don't need to buy any of that! The best was pumpkin malted milk balls (instead of chocolate). Also a new experience and they go on the treat list, rather than the tricks. I think the best of the best was reading about the composers in the program. It seems that I can place myself among the greats. Here's what it said of Mussorgsky. "Modest Mussorgsky was the most individual composer of the lot of five innovative Russians. He was undisciplined, had a drinking problem [not tested, but I'm sure I could develop one if needed], and rarely finished any of the many compositions he started." Sound familiar? I'm still chuckling. Turns out he didn't even finish Night on Bald Mountain. It was finished after his death by Rimsky-Korsakov who described that effort as "difficult, and for two years I could find neither the form, the key-scheme, nor the scoring." But thanks to R-K's persistence, we now enjoy this piece which has become so familiar.